When you only have about 1 second to send a visual message, it’s all about image and perception. Especially in politics. 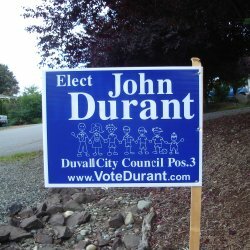 Here’s an example from a local city council race. I’m impressed with this candidate’s use of an image to tell a story. He tells us a little about what values he holds high. I hope he will work to keep our community and neighborhood a family friendly place to live. And, I like that he has a website to go to for more details. He looks well-organized. I can check him out without much effort. He has made it easy for me. His use of the color blue seems appropriate because his opponent is using red. I feel good about this guy even though some people may not agree with my perception of him. This candidate is evidently the incumbent. I can tell by the use of the word “retain” rather than “elect”. 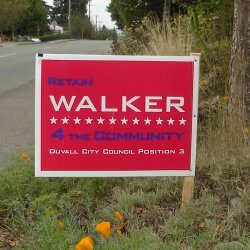 I would hope the winner of the election works “4 the community”. That’s sort of understood, isn’t it? I wonder what all the stars represent? If I don’t find enough time to learn more about the individual candidates viewpoints and what they stand for, I will probably vote for that blue sign guy with the family friendly drawing. I just sort of feel better about him. Like in many elections, you sometimes vote for the name with the most recognition, translated to mean the most signs. But what can a sign that gets about 1 second of our mind while traveling down the street convey to us? Colors, symbols, images, pictures; They are all important and stir our emotions based on our different life experiences. Think about the impressions you send with your business ads and marketing materials. What are YOU selling? Are you using imagery to YOUR advantage? Howard Howell writes about the art of selling. When not writing, he is teaching or coaching business owners how to increase their selling effectiveness with common sense and experience. This entry was posted in Marketing and Advertising, Selling and tagged image, perception, sell, Selling. Bookmark the permalink.